Valerie: It is Tuesday, the 3rd of November 2015; and we are calling upon Cosmic Sai Baba to make his presence amongst us. ❝I am here! And I am very pleased to be here. I have been here for quite some time. And I have seen what has taken place today. And I think other gods have learnt from what has taken place. This is to do with energy. Everything is energy. And if you can see that – it also follows then – to a form. But, that is something to think about. Because every energy in a form has a different frequency. There is separation, in other words. But, it does mean that they cannot interact. So if we are thinking about people, people can interact – they may be very different – different energy; different forms, but they can still understand, respect each other and learn to respect their differences. And this is Universal Love. This is important message, because today … is a time on this Earth of yours … when there is great worry and concerns about a lot of movement of people around the Earth. And the Earth itself is trying to help these people. The Earth herself has a form – an energy – it is a being and it has a consciousness. And this is exactly as it is with people, or any living thing upon this Earth. It has light. Now, the light can be measured in many different ways – but again – it has a frequency and it has a consciousness. And we can learn to live with one another. I am thinking of plants, for instance. Or anything that is created from the Earth. Mother Earth has learned to live with everything, and she responds to everything. She is part of your creation here upon this planet. And if you think about it – the way SHE handles things … it is ALWAYS FOR THE GOOD OF ALL. And this – of course – is interrupted sometimes by man’s activities upon her. Such as digging unnecessarily into the Earth herself. If she wants to change the energy fields, she creates volcanic disruptions; or tsunamis, or events that will move things around. And that is always done with the consciousness of all living things. So if you think about this, there might be quite a lot of lives lost – but these agreed to this at another level – at a Soul level. This might be a little hard to understand. But then, all beings – all living humans upon this Earth – live a very short time indeed – when you think about it; and I have spoken about this before. I have asked you also, to realise the life you have upon this planet is really only a very tiny little bit of what you are and who you are. Your Soul has been at other times – your soul has a story – an infinite story. It has been to many places, many worlds, many different races – races that look very different from what you do here as a human. But you have been there. And so those influences come with you through your soul and are influencing what takes place upon this Earth. I’d like you to think about that – because nothing on this Earth has not come from somewhere else. Even the way the culture operates in different races. It has come from somewhere else. So you are constantly being influenced by other worlds – and other beings. Even although they may look different … I would like to remind you that the consciousness is the same. The language may be different, but when you learn to communicate by images – which is a little like telepathy – then they will always understand you. So if you communicate with images, these people will understand you very well – what someone is communicating about. Think about this. In other words – what I am saying is there is no separation really; everything is ONE. And when it comes to the Source of All Creation – this is where everything began; this is where it will all end. Then, at another time, humans become something else. So think about that. Please learn to love one another. To accept the differences – even though you may not understand them. If you can try to understand each other and speak more about the differences … and change the way you phrase the sentences so that what is not understood in the first place – it may be understood in another way – and you will find that really there is not much difference with anyone upon this Earth. None of the humans at all … NO difference at all. They all come from the same Source; and they all return to the same Source which is the World of Light. Please think about this. Thank you, thank you, my Beloved Children for allowing me to come here this day and to remind you of who you really are – which are Light Beings from the World of Light. Before the transmission commenced, we played the Temple bell to clear energies in the room prior to commencing our meeting. When energies have cleared it raises to a HIGH energy field that allows the Highest Order of other worlds to come through, and the Temple will ring out loudly, clearly and strongly. Well, on this day the bell would not sound as I circled it with the wooden stick; when I do this, the bell usually rings quietly and then becomes louder and louder. The first time it would not sound at all. So I asked everyone to join me in intoning the Holy AUM. 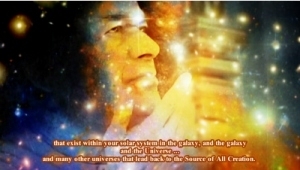 (Cosmic Sai Baba has shared with us that whenever we chant AUM, divinity comes and is present with us.) The bell still would not make a sound. Then we continued a number of times and still the Temple Bell would not sound – a revelation to us – there was a very heavy energy present. To make a long story short, one of the ladies had been attempting to make contact with upstairs and was inviting spirit to come in to her and speak through her. Assistance was given to her … enabling her to release the heavy energy that had overtaken her. It was was also an ADDITIONAL opportunity for that heavy energy to be released and sent to the Divine Light of God. This lady was then advised how to clear her energy field first, before then calling upon the spirit from the HIGHEST ORDER in the name of God to come to her. Her practice was to be at another time. However, she agreed it had been most helpful in assisting her to do work with the HIGHEST ORDER in the name of GOD. We know we had been ‘set-up’ to show other worlds how to assist heavier energies.